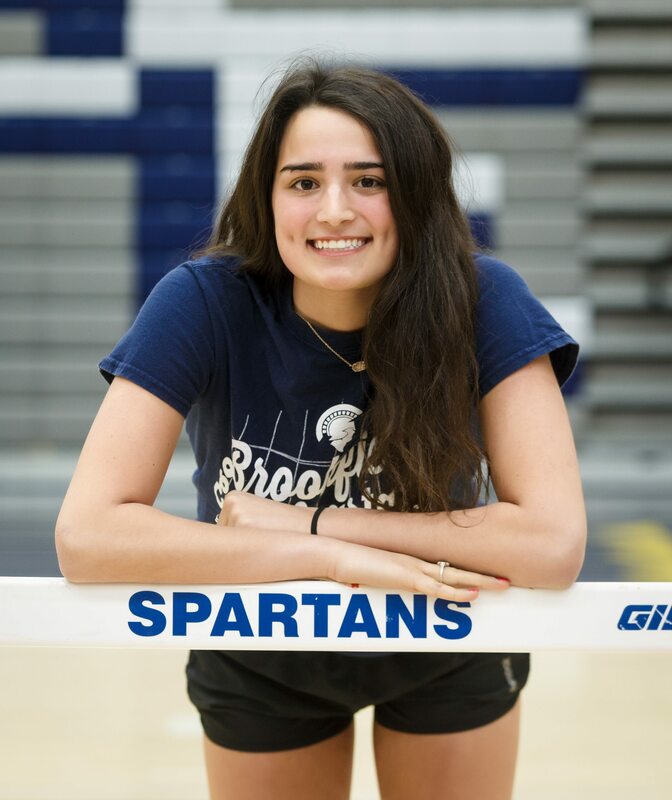 Growing up with four older brothers, Brookfield East senior Eleni Tongas had a lot of competition to deal with in her own household. That competitive drive developed in her younger years has paid off for Eleni in track and field and school in general, as she has excelled in the high jump and 100 hurdles, among other events for the Spartans, who finished second last spring at the WIAA Girls Track & Field Championships as her tie in the high jump gave East the half point advantage to finish second. "I always want to get better," the expressive Tongas said, recently after practice. "I always work hard because I'm really competitive growing up with four brothers (Demetri, Nikita, Peter, Steven). We were always in competition of some sorts. I think because of my competitive drive I always want to get better and achieve the most I can." Tongas is determined to make her third straight trip to the state, where she finished fifth in the high jump last year. The Lady Spartans as a team are off to a good start, as they won the Greater Metro Conference Indoor Championship so far this season. Eleni was first in the high jump, second in the triple jump and third in both hurdle events. Coach Lisa Farley talked about other reasons why Eleni, who holds the conference relay record in the high jump, has been so successful. "Her passion for her events for the team is why she has the results she has," Farley said. "She works really hard. She's focused, she's dedicated as an individual but also with the team. "We've won a lot of conference championships and she wants to keep that going. It keeps her focused on the team as well. During meets you never hear she is nervous. She's always excited and goes out and gives her best, running back and forth between events." Farley talked about the multi-tasking Tongas when it comes to her events. "She'll take part in the 100 hurdles, high jump, long jump and the triple jump," Lisa said. "We weren't sure about the triple jump. At conference she did it and we were counting on her for 32 feet and she went up and beyond (34). So we might have something there. 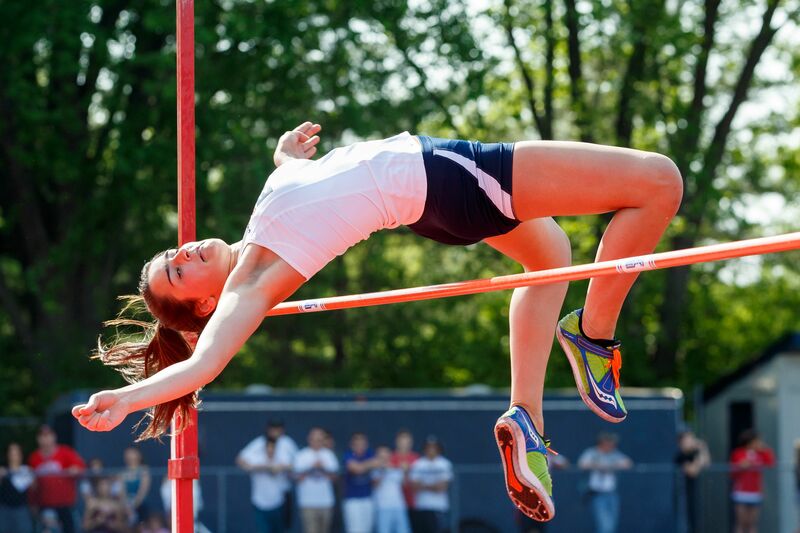 "But her best event is the high jump (she had a personal best at 5-feet, 5 inches in the sectional last year). She is so graceful, fun to watch. Her dance competition helps her with that." Tongas agrees with her coach. "The triple jump, long jump, I don't get to practice them as much, but this year I might focus more on them," she said. "I got second in conference at triple jump - I came out of no where. I'm excited for that. I think that will be fun too." But high jump is a special event for Eleni. "I like high jump the most. I think I like high jump because that's what got me started in track," she said. "It's just kind of been something to push myself in. You always have to try the next height, so you never get to stop and get off easy. "You have to keep going and keep pushing yourself. If you see yourself miss a height, you want to clear it more. So you go to practice and you have to work harder." Despite her success, Tongas does have parts of her game to work on. "I definitely have a lot of things I can work on," she said. "I need to work on my blocks starts. First one to the first hurdle, first one to the finish line, that's my mindset. In the high jump, when I get to the higher heights, I need to keep my form." "Everyone - no matter if you're the best Olympic athlete or not - have things to work on," she said. "To be able to pinpoint specifics on high jump and hurdles, it's the little things that are achieved which will get her back to state." Tongas remembered her start in track came in her seventh-grade gym class. "We did all the events, but I liked high jump. So I did it in middle school," she said. "I quit soccer for track. That was the game plan because I played soccer my whole life and you can't do soccer and track (same season) in high school. I just enjoyed it (track) more." Tongas admits people look at track as an individual sport, but it's the bigger picture that she enjoys. "It's an individual sport, yes, but then it links to the team sport," she said. "I thought that was cool because you are able to push yourself individually because you want to help your team. I just kept wanting to get better to help our team. It's an individual sport because you run your own race, but you can see how the team points pay off, especially at sectional and state." Farley recalled when she first knew she had something special in Tongas. "She is personable, a great teammate, works hard and wants to do her best. She is somebody who is always super busy." ­Her freshman year she was second in the high jump in the Greater Metro Conference meet and eighth in the long jump and finished fourth in the high jump at regional. Her sophomore year she was second in high jump, third in 100 hurdles and eighth in the long jump in conference and third in the high jump and 100 hurdles at regional. It was her first exposure at state and she participated in the high jump and 100 hurdles, but didn't place. Eleni recalled the moment. "State was the craziest experience," she said. "You walk in and it's literally roaring. There are so many people in there. It was really cool my sophomore year too because I focused in on high jump and then at regional I qualified in hurdles. So then it was go big or go home. "I feel that (hurdles) are one of the craziest ones (events) at state because it's so fast. I think when people think of track, they think of hurdles a lot of times. I just want to have fun there in the individual race." Well, Tongas had fun her junior season. During the regular season, she finished first in the high jump, fourth in the triple jump, fifth in low hurdles and seventh in the high hurdles in the Indoor. In the Outdoor she was first in the high jump and third in the 100 hurdles. In the postseason she won the high jump and was third in the 100 hurdles at regional and won the high jump and was fourth in the 100 hurdles. At state, was placed fifth in the high jump. Tongas' leadership skills go back to her family according to Farley. "Growing up with a Greek family, four older brothers, being very vocal, that's a part of her personality and background as well," Lisa said. "So when she was around the older girls, the younger girls, it didn't really matter who she was around, she's comfortable around everybody. "That's why I sought her out right away as a junior captain. She was able to fit with whoever and ask people to step up. "She is very committed to our team, that's why she's been a team captain for the second year. She leads by example but she also gets the girls to follow along, which is great." Tongas enjoys wearing the leadership mantle. "I think it's really important to be a good leader in track," she said. "A lot of times people get down on themselves if they are not competing at their best. I try to be a role model for the girls so they have someone to look up to. "I can demonstrate what they should do - leave your events in the moment. You can't carry them with you. If you had a bad high jump, you can't carry that to the hurdles." Eleni was quick to point out that the Spartans have four captains, with the other three being Meg Swietlik, Erin Donnelly and Natalie Rouse. "But we're all in a variety of events," Tongas said. "We can answer a lot of random questions, but a lot are track oriented. We try to create an environment where they can ask whatever they want. Tongas then spoke about how important teamwork is in a sport that's filled with individual events. "It's really nice to see your hard work pay off," she said. "So many crazy things can happen. We won the GMC (Indoor) by 5 points and finished second at state by 1/2 point. I think that's important that we all work as a team. Sometimes you have to do a bunch of events, but you have to do that to benefit the team." And that's what Eleni Tongas is all about. FAVORITE MOVIE: 'Wreck It Ralph,' Romantic Comedies. MOST MEMORABLE SPORTS MOMENT: Finishing fifth in high jump at state last year. WHAT WOULD YOU LIKE TO DO IN THE FUTURE? Attend the University of Wisconsin - Madison. Study School of Human Ecology or Fashion.